[Via Satellite 10-16-13] Thales Alenia Space Italy has been awarded a contract by the Italian Space Agency to build the Multi Element Telescope for Imaging and Spectroscopy (Metis) instrument, in conjunction with Compagnia Generale per lo Spazio (CGS). The Metis instrument will be used on the European Space Agency’s Solar Orbiter scientific satellite. The Solar Orbiter satellite, scheduled for launch in 2017, will carry out the first observations of the Sun and its environment at a distance of just 0.28 Astronomical Units (i.e., 28 percent of the mean distance between the Earth and the Sun). The Metis instrument will offer simultaneous high-resolution imaging of the full corona in polarized visible light and in ultraviolet light. An Italian-led international scientific consortium will support it, with funding from the Italian Space Agency. 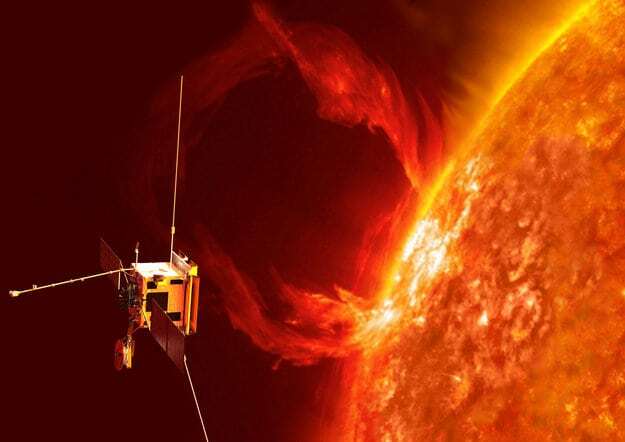 Thales Alenia Space is additionally contributing one of the key spacecraft components for the Solar Orbiter: the heat shield that will protect the satellite and its instruments from temperatures up to 700 degrees Celsius when it reaches the minimum distance from the Sun.